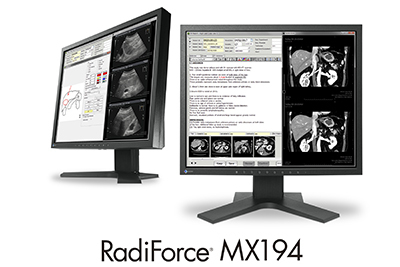 Hakusan, Japan, April 5, 2018 – EIZO Corporation (TSE: 6737) today announced the release of the RadiForce MX194, a 19-inch clinical review monitor designed for viewing medical charts and images such as DSA (digital subtraction angiography), CT (computed tomography), and MRI (magnetic resonance imaging). The MX194, the successor to the MX191, is a 19-inch clinical review monitor with a 1 megapixel resolution (1280 x 1024 pixels). Compared to the MX191, the brightness has increased from 300 cd/m2 to 350 cd/m2. EIZO guarantees 10,000 hours of use when the brightness is maintained at 180 cd/m2. Furthermore the monitor is equipped with EIZO’s DUE (Digital Uniformity Equalizer) function, which ensures that the brightness is uniform across the screen. Additionally, the monitor is compliant with DICOM Part 14*, meaning that it can faithfully reproduce medical images such as DSA, CT, and MRI for long periods of time. The RadiForce MX194 will begin shipping in June, 2018. Date of availability varies by country so contact the EIZO group company or distributor in your country for details.